1. Delivery: FBA arrived 2-3 days,self shipment delivery 3-5 days,standard delivery 7-15 days. 2. 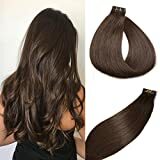 Quality: Use Italian ice silk gel,can be used normally for 6-8 weeks,Grade 7A 100% real human hair tape in extensions,can withstand 420 degrees Fahrenheit curl,straight,styled. 3. Instruction: Package include 20 pieces/30G.If your hair is thick we suggest 2-3 piece.If thin we suggest 3-5pieces.You can apply a full head of tape hair within 30 minutes,after you get your hair extensions 48 hours,you can wash,swim,etc.Hair life:lasts 3 to 6 months with proper care. 4. Service: We reply the email within 12 hours.If you are not satisfied with our product,we will return it without any reason in 30 days. (Before you return, please contact us and keep the package intact). 5. Color:All pictures are taken by SeaShine.Because the light and display equipment are different,the actual hair maybe has colour difference.Please understand.If you have special needs,you can contact us to made for customer.